The Metz mecablitz 36 AF-5 digital Flash is an entry-level Pentax P-TTL compatible flash with a durable design and sophisticated functionality. 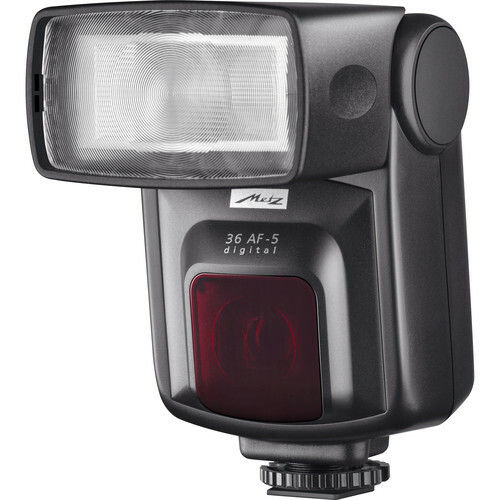 This flash was designed for ease of use so that even beginner photographers will find it easy to attach and operate. Bounce flash is easily accomplished by tilting the flash head upwards to a maximum of 90 degrees. This flash also features a zoom reflector which can be adjusted manually from a focal length of 28 to 85mm to achieve an optimum illumination angle. For future compatibility, this flash's firmware can be updated via Metz Service. Box Dimensions (LxWxH) 6.5 x 3.0 x 2.5"
mecablitz 36 AF-5 digital Flash for Pentax Cameras is rated 4.5 out of 5 by 2. Rated 4 out of 5 by Rdz from Good flash Good flash, but the rear curtain sync function from my Pentax K-5 does not work with this flash. Rated 5 out of 5 by Thomas from Great value! I use it on my Pentax K-3ll camera and I have dependable results. It holds it charge for a long time. I usually set my camera for X mode (180th sec.) and It has 4 power settings which serves my purposes quite well. Is this flash compatible with the Pentax K-30 DSLR camera? Yes, this flash is fully compatible with the Pentax K-30 DSLR camera. Will it work TTL on a Samsung NX 500?